One of my first insights into spanish cinema, I dunno how i missed out on writing a review for this! There is none to compare this movie with. Certainly one of the the best i've seen. 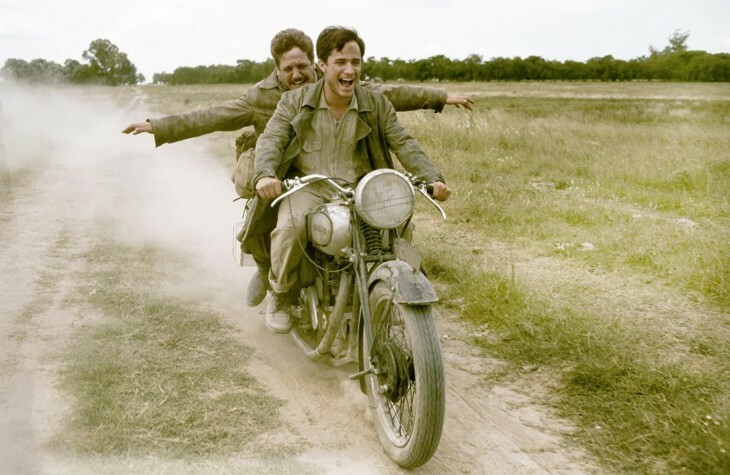 THE MOTORCYCLE DIARIES is certainly one of the finest films of the year - a daring, compassionate re-creation of the journey of two young, well-to-do Argentinean lads who leave their privileged positions of biochemist and fourth year Medical student to follow their idea of traveling by motorcycle from their native Buenos Aires down to Patagonia, up through Chile, Peru, Colombia to Venezuela. Sounds like a light hearted Trip Movie, but instead this journey, factually made by one Ernesto (aka 'Che' and 'Fuser') Guevara de la Serna and his close friend Alberto Granado ('Chubby'), is one of the most touching and sensitive passages into self acceptance and awareness of the world as a place where equality of people is a microscopic speck of illusion that is revealed by a carefully constructed script by Jose Rivera based on the diaries of both of these men made during and after their journey. Walter Salles ("Behind the Sun", "Central Station") once again proves himself a director who can infuse his vision of a story with uncomplicated directness of approach, having the sensitivity to allow his well-chosen actors to create wholly believable, three-dimensional characters, whether the actors are the leads or simply minor roles that hold the camera's eye for seconds. Motion Pictures are not one, but many genres. There are films poised solely to entertain, others to politicize, and yet others are art. FREE ZONE is art in a film format. Just as most art, it relies more on senses, feelings, aesthetics, and perceptions. Unfortunately, for the unimaginative and unengaged, it can sometimes be unintelligible. The film begins with a very long close-up shot of a beautiful young woman (Natalie Portman) copiously crying in the back seat of a car, to the Jewish children's rhyme "Had Gadia". The powerful arrangement in crescendos adds pathos to the girl's exteriorization of heart-felt anguish, and the seamlessly-never-ending stories of increasing consequences and characters (sung in Hebrew but appropriately subtitled) add confusion and exasperation. The sense of utter discomfiture is only compounded by the audience's utmost ignorance of the character, her surroundings, and her motivations. Her despair is our despair, but we, much as she also seems, are lost. Slowly we learn she is parked by the Kotel, or Wailing Wall, in Jerusalem. We also learn she has just fought with her would-be mother-in-law and broken off her engagement to her Spanish-Israeli fiancé. Thus her personal loss becomes the middle-eastern mourning, and her very personal suffering symbolizes the tears and hopelessness of whole peoples and an entire land. Immediately one is faced with a choice. To watch the rest of the movie as a narrative, or to perceive the allegory it propounds. To choose the first is to misunderstand it entirely, and miss on the powerful images and senses. Rebecca (Natalie Portman) is an American who struggles aimlessly through life without a clear sense of identity. Her father is Jewish, but she carries little or no pride in her heritage, ignorant even of her status as a Jew (or not). She feels uneasy in her American home, and in a search for an identity that suits her, she acquires (and loses) a fiancé and a home in Israel. How she reacts to the landscape (so extensively shot, in exquisite details) and to the people (diverse, albeit through quick and superficial contacts) symbolizes the author's perception of the American (as in people or nation) own sense of identity and appreciation of the Middle East. She joins Hannah (Hanna Laslo), a Russian-Israeli middle-aged woman whose life stories unfold piecemeal as a symbolical-historical window on the Israeli nation, on a trip to the Jordanian free trade zone on a mission for personal and familial financial salvation. Her determination and her biases (often even callousness) are obviously shaped by her pressing needs and her clear life trajectory, as evidenced by the unusually thorough (as opposed to the other characters) exposition of her past. Her reactions to her American travel mate, the obstacles in her quest, and the eventual Palestinian they meet clearly embody the Israeli national persona, dreams, fears, and strengths. The Palestinian our heroes meet is Leila (Hiam Abbass), whose family present as Hannah's possible salvation (as in the money her husband owes her) or damnation (as in the fall-out from the misguided actions of her rebellious and contentious son). Torn between her loyalties to her own family and her duties toward this Jewish woman, she joins the other women in their quest for redemption. The women allegorize their respective nations. And yet, their struggles are very personal and transcend national identities and interests. The combination of the three, and how they interact amongst themselves to work out their individual travails, masterfully conveys the powerful emotions in the confluence of tribes, nations, countries, and religions in this most convoluted region. The attention to the national frontiers (what role they play in segregating these peoples) juxtaposed to the more promiscuous exchange amongst the actual peoples (their representational counterparts in the characters) is quite fascinating. The narrative is non linear, relying mostly on feelings and emotions. The filmography is untraditional (a lot of hand-held camera movements, as if the audience is privy to the story, watching a family road trip video) and experimental (long and confusing, yet dramatic, layering of images and back-plots, creating familiarity with back stories, yet maintaining distance thru the lack of clear focus or images). The plot is mostly allegorical, therefore characters are not really introduced and developed as they are thrust upon the audience (with the implication that one already knows them, or who they represent), played out in short pericopes and less of an overarching story. The film is beautiful and insightful. If you prefer mass produced Hollywoodean one-size-fit-all entertainment, this is not the movie for you. A truly haunting WWII movie that will remain a classic for years to come. The movie is gonna come up at Sathyam, I heard. The seats shall tremble with this bomber. "I've got the feeling that I should be angry with this child, this young and oblivious girl. Or that I'm not allowed to forgive her for not seeing the nature of that monster. That she didn't realise what she was doing. And mostly because I've gone so obliviously. Because I wasn't a fanatic Nazi. I could have said in Berlin, "No, I'm not doing that. I don't want to go the Führer's headquarters." But I didn't do that. I was too curious. I didn't realise that fate would lead me somewhere I didn't want to be. But still, I find it hard to forgive myself." -Traudl Junge. Downfall is the third major filmed account of Hitler's final ten days, following in the distant wake of 1973's Hitler: The Last Ten Days and 1981's The Bunker. A superior production to both of the earlier movies, Downfall is a windfall for anyone who, like me, is fascinated by stories from World War II. The first internationally released German production to feature Hitler as a central figure, Oliver Hirschbiegel's film has been criticized in some circles as presenting a portrait of the Fuhrer that is "too sympathetic." In fact, nothing could be further from the truth. As portrayed in a powerhouse performance by Bruno Ganz, Hitler comes across as a petty, demented figure who spews bile as he rants and raves. The lone exception is an establishing scene in 1942 (when Hitler chooses a secretary), where he appears almost grandfatherly. Other than that, he is shown to be a conscienceless, hateful madman who believes his people deserve to die because they are no longer fit to live. Based on the memoirs of Hitler's secretary, Traudl Junge (Alexandra Maria Lara), and Joachim Fest's Inside Hitler's Bunker, Downfall goes for rigorous historical accuracy. The recreations of a bombed-out Berlin are especially impressive. Like in Stalingrad and the recent The Pianist, Downfall takes us into a realistic replica of a city that has been devastated by countless days of bombings. Small dramas are played out in the streets as the larger one unfolds beneath. Hitler, completely out of control, rants about betrayals by his henchmen (Himmler has gone to the Allies to sue for peace), and tries to place troops that no longer exist. By the end of his life, it's clear that Hitler is no longer in command of anything - neither the country he raised to glory then smashed to ruins nor his own mind. The most sobering scene in the movie, however, does not feature the Fuhrer. Instead, it centers on the wife of Joseph Goebbels. In a scene lifted out of the history books, she doses her children with a sleeping draught, then, when they are unconscious, she crushes cyanide pills between their teeth. She does this coldly, almost robotically. It's a chilling scene, and, despite its bloodlessness, is difficult to watch. This kind of blind devotion offers evidence of why Hitler was so dangerous at the height of his power. What kind of charisma would it take to convince a mother to murder her children rather than let them live in a world where the Nazi party was dead? By the time the Russians arrive, the film is essentially over. We see the fates of most of the major players, including Hitler, Goebbels (and his wife), Eva Braun, Junge, and a number of top generals and aides. The life-stories of others (those who survived beyond the fall of the bunker) are related through captions. Downfall never loses its focus by seeking to broaden its scope. This allows us to absorb this one aspect of a humongous tragedy, rather than being bombarded by too much information in a movie whose reach exceeds its grasp. Sixty years after his death, with nearly all of his confidants and confederates in the grave, Hitler still fascinates students of history. The most malevolent and important man of the 20th century, the likes of the Furher have not been seen since he blew his brains out in the guts of his bunker. Next to Hitler, Osama Bin Laden and Sadaam Hussein are in nursery school. Movies about the late dictator often disappoint because directors are wary of the subject matter; Hirschbiegel pushes forward, telling his story without varnish. The result is a movie whose forcefulness kept me thinking about the subject and its treatment long after the lights had returned to the theater. Downfall and Bruno Ganz are deserving of Oscars they will not get (although Downfall was nominated for Best Foreign Language Film). However, the limited U.S. release by Newmarket Films will allow anyone with an interest to have an opportunity to see one of the most finely-crafted World War II films ever made. 1633. Galileo is a recognized and supported scientist. But at the same time the princes and the men of the church, of which the pope Urbain VIII himself are impassioned like so many others by the works of the scientist. But it is precisely this work and the theories which it defends, judged the heretics of the Church, who summon Galileo to appear before the Enquiry. Vis-a-vis his indicters, Galileo will have, against the danger of his own life, to expose his theories, by proving that his discoveries are not incompatible with the idea of God, without disavowto his convictions of man and science. The Dialogues, Galileo's masterpiece, were published in 1632 with the approval of Catholic censors. It was applauded by intellectuals but nevertheless aroused the Church's ire. Despite his continued insistence that his work in the area was purely theoretical, despite his strict following of the church protocol for publication of works (which required prior examination by church censors and subsequent permission), and despite his close friendship with the Pope (who presided throughout the ordeal), Galileo was summoned to trial before the Roman Inquisition in 1633. During this interrogation Galileo stated that he did not defend the Copernican theory. A scientific and theologic fight began between Galileo and his three prosecutors. Galileo had the bigest difficulties to hide he deeply considered the Copernic model could be the good one. The church, leaded by dogma, went on arguing about his convictions. The trial lasted several monthes. The Inquisition held the final hearing on Galileo, who was then 69 years old and pleaded for mercy, pointing to his "regrettable state of physical unwellness". Threatening him with torture, imprisonment, and death on the stake, the show trial forced Galileo to "abjure, curse and detest" his work and to promise to denounce others who held his prior viewpoint. Galileo was sentenced to prison, but because of his advanced age and Church politics the sentence was commuted to house arrest at his villas in Arcetri and Florence. Leaving the trial, Galileo, old and exhausted, whispered the famous sentence: "Eppur si muove" (But it does move!). I've recently developed a sense of pity for many of my friends who work in call centers. As far as I can see, this one is the most sickening jobs in the world. You get paid a nice lump, but underneath that, you get a suction needle stuck right into your nerves, your mind, your psyche. Everything about the job reeks of an unhappy career, starting with a new name, an alias for you, well in this case:John and Jane. Directed by Ashim Ahluwalia. Chances are that if you live in the West and you call an airline or credit card company your call will be routed to a call centre in India. The agents who work there are the subjects of a new film called 'John & Jane'. This film profiles six agents working in a Mumbai call centre whom we see at home and at work, where they spend hours on the phone talking to customers in America. The idea of John and Jane is based on the aliases these characters have to have. Everyone has to have an American name that an American caller would feel comfortable with, so when you first join a call centre you get asked to pick an alias and that becomes your American identity. The film is divided into three parts - the first two characters don't really like the job and Sidney actually wants to be a Bollywood dancer. He doesn't really want to be working the call centre; his English isn't really very good, so he's perpetually getting the phone slammed down on him. He's just disgusted with the job and he wants to be doing something very different, whereas the second set of characters and the last set of characters are actually getting more and more into the American universe. 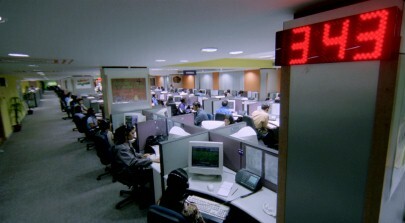 Some of the workers profiled in the film feel used and abused, and call centres have been called modern day sweatshops. The productivity of the workers is aggressively monitored and the workers also have to tolerate racial abuse from American and British callers. The film shows lifts the veil on some of these less pleasant aspects of the job.